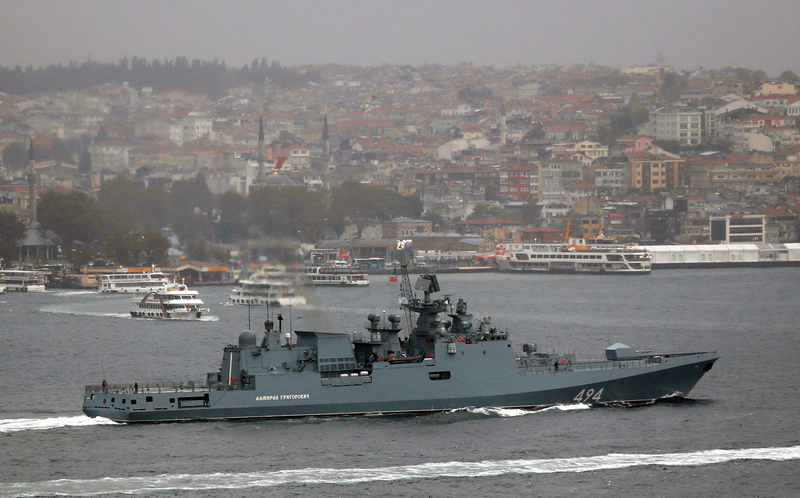 The Russian Navy's frigate Admiral Grigorovich sails in the Bosphorus on its way to the Mediterranean Sea, in Istanbul, Turkey, November 4, 2016. The Russian Armed Forces have launched a large-scale operation to deliver strikes against terrorists in the Syrian provinces of Idlib and Homs, including with the involvement of the aircraft carrier Admiral Kuznetsov, Defense Minister Sergey Shoigu said on Nov. 15. The defense minister made this statement at a meeting with representatives of the Defense Ministry and the defense industry held by President Vladimir Putin. "Today, at 10:30 and at 11:00, we started a large-scale operation to deliver massive fire on the positions of the Islamic State and Jabhat al-Nusra in the provinces of Idlib and Homs," Shoigu said. According to the Russian defense minister, the operation involves the frigate Admiral Grigorovich that has made launches of Kalibr cruise missiles, Bastion coastal defense systems and "for the first time in the Navy’s history, the aircraft carrier Admiral Kuznetsov has started to take part in combat operations."